← Professionalism: Evidently, I Haz It? I just couldn’t turn today. Or,well…that’s not entirely true. I nailed a few really nice singles and maybe one nice double, but it wasn’t a good turning day. My spot was, for some reason, extra slow. My working foot didn’t to go where it was supposed to (seriously, at one point I closed an en dehors turn with the toe to the front of the knee, then moved it to the back immediately … just, WAT?!). I hopped out of more than one double. I blame my left ear, which is being weird. At one point I had to lie down on the floor and give myself a bit of the ol’ Epley Manœuvre. 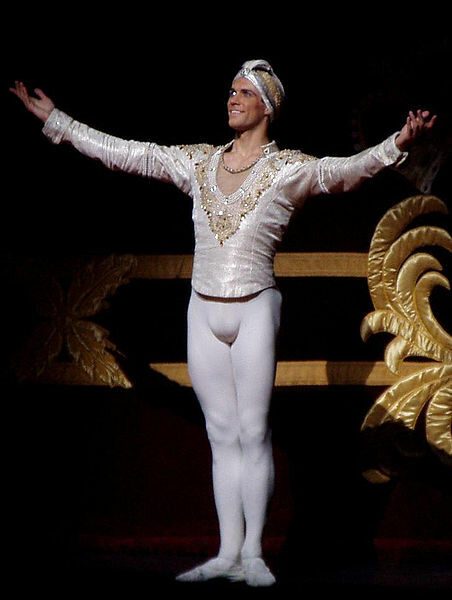 I also blame Roberto Bolle, who showed up last night in one of those dreams that just go on and on, no matter how many times you blink briefly awake. I don’t remember it terribly well, but I think we were doing Swan Lake, with Bolle both dancing and directing. Mostly I remember him yelling at me about my arabesque: higher, straighter, point that working toe harder, what’s that supporting foot trying to do? Get that demi-point UP! Dr. Dancebelt also featured in this dream as a disembodied voice over the house PA system. I remember thinking that was odd: we never saw him, but we knew he was there. Ultimately, this is what I get for watching Paris Opera Ballet doing “Études,” Bolle in “Manon,” the remainder of Bourne’s Swan Lake (2012) all one evening. Weird dreams and bad turns. I wasn’t awesome at the grand allegro: it ended with a change of direction via piqué soutenu, and I just couldn’t remember that. On the upside, my extensions are back above 90 even à côté, I managed not to flail in tour lent en attitude, and I actually didn’t hose up the petit allegro. So there you have it. Wednesday, now with 100% more advice from Dream Bolle. Posted on 2017/03/22, in balllet, class notes, it is a silly place and tagged bad turns day, dream advice, roberto bolle, tread lightly — you tread on my dreams. Bookmark the permalink. 10 Comments. Presumably the manoeuvre was deployed after you had a negative Dix-Hallberg test? I must ask my dad if he has bad [x] days on the trumpet. I don’t remember having “bad fret days” on guitar but I totally have bad turns days. Hmm. Now I’m trying to renege whether I had “bad bowing days” on the violin! Bad turning days, though … Those are definitely a thing. My tablet. It hates me. Ahh we all have days like this! Really enjoyed this post! OMG, yes! I like to think that these are the days on which my brain is busy filing all the stuff I’ve learned recently 😀 Also, thanks! Hey, you don’t say no to free ballet coaching, even if it’s just in a dream! I have days where I struggle to do even a single turn but fortunately, they are rare. And sometimes, there are even particularly good turning days to make up for it. Hey, advice from (dream-) Bolle – my boyfriend would be jelous :). I like turns, but they aren’t my thing, exactly. Yesterday, urban contemporary I created the great ballet mixup. Pencilturns with turned out feet, and learning some weird new turn where the leg comes last, wrangling the whole body in a spiral first. It simply knocks me out of balance. And some kind of turn in floorwork knoting your legs – my body refused to learn this on the first try. Congratulations for your successful show. Oh, dear—I think I’d wrestle with those weird spiral things, too. They sound like backwards reverses!